A KOTOBUKIYA Japanese import! Kotobukiya’s line of DC Comics ARTFX+ Statues continues, capturing the look and costumes of DC Comics Super Heroes and villains. Following up on the Justice League comes one of Batman's most popular antagonists (and sometimes partner), CATWOMAN ! Stealing the limelight in her skin tight leather jumpsuit and carrying her trademark whip and claws, Catwoman stands in a relaxed pose, yet is light on her feet, ready to ei ther fight or flee as the situation requires. Selina Kyle's first appearance in the ARTFX+ lineup captures her classic look perfectly. The details on Catwoman are exceptional from the intricate folds and seams on her costume to the small touches like the zipper, boot buckles, whip, and claws. Kotobukiya’s unique take on Catwoman features a reflective sheen to her black cat-suit, with her fully painted features visible through her goggles. Standing nearly 8 inches tall (in the ARTFX+ 1/10th scale), Catwoman was sculpted by master artist Goutaro Takeuchi (Atelier Bamboo), who previously sculpted the DC Comics New 52 Justice League ARTFX+ statues. 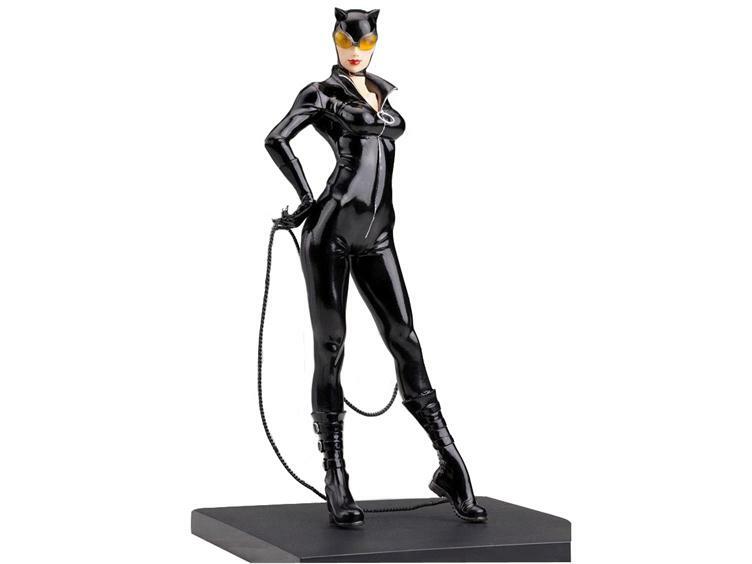 Like the other DC ARTFX+ Statues, Catwoman has magnets in her feet for perfect stability on the included base, and she’ll look great displayed on your shelf by herself or alongside other DC ARTFX+ statues.